SGII6B1/3 has potential uses for chromatogranin diagnostics. Our Abpromise guarantee covers the use of ab20245 in the following tested applications. 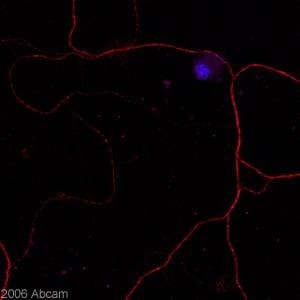 Confocal image of immunofluorescence staining with Mouse monoclonal [SGII 6B1/3] to Chromogranin C/SGII;(ab20245; 2µg/ml for 1h at room temperature) in red and nuclear counterstain in blue on Rat Cell (Hippocampal neuron culture). Cells were fixed with paraformaldehyde; BSA (5%) was used as a blocking agent (40 minutes at room temperature). Secondary antibody was Goat anti-mouse IgG2b Alexa Fluor 568 Conjugation (1/600). IHC image of ab20245 staining in normal rat brain formalin fixed paraffin embedded tissue section, performed on a Leica BondTM system using the standard protocol F. The section was pre-treated using heat mediated antigen retrieval with sodium citrate buffer (pH6, epitope retrieval solution 1) for 20 mins. The section was then incubated with ab20245, 1µg/ml, for 15 mins at room temperature and detected using an HRP conjugated compact polymer system. DAB was used as the chromogen. The section was then counterstained with haematoxylin and mounted with DPX. I am searching for a secretogranin 2 (chromogranin C) antibody that works on mouse material in ICC application. It has to be of a non-rabbit origin. Would Anti-Chromogranin C antibody [SGII 6B1/3] (ab20245) be suitable? If not, do you have an alternative? Of the Chromogranin C antibodies we have, ab20245 will be the best non-rabbit-host choice. It has not been tested for reactivity with mouse samples but the immunogen sequence, derived from rat protein, is 100% conserved in mouse Chromogranin C. However, we do not guarantee reactivity with untested species, which would include mouse in this case.